Rounding out our coverage of Combiner Wars Victorion, we’re sharing a look at the final two members of the Torchbearers, Pyra Magna and Rust Dust! Pyra Magna is a remold of Hot Spot, and thanks to her predominantly red deco, it means we’ve got ourselves a red fire engine! Her remolding gives her a new chest, new hands, and new head, plus the remolded Victorion chest means Pyra has a different design on her ladder, which helps to give the vehicle mode a slightly different look. The solid design, great sculpting, and reuse of a good mold means Pyra is my personal favorite of the Torchbearers. She’s not flawless, though – there’s the widely-documented assembly issue with the tabs on her leg hinges that, without modification, stop you from transforming her robot mode legs properly. I also found one of her legs would not lock in properly for Victorion mode – so one leg was always popping out when I picked up Victorion. Rust Dust meanwhile is a straight redeco of Legends Groove, and done mainly in mint green and black, which is a very dynamic and eye-catching deco. I would have loved a new head here, and even more, a weapon – given how Victorion’s other five bots got new weapons, it is a real pity Hasbro couldn’t have worked in one more piece on the sword and given Rust Dust a weapon too. Also, watch this one for paint chipping – her arms including the tabs for Victorion chest mode are painted, and I found this paint chipped after spending some time with her in chest mode. These issues and her not attaching well to the combiner mode chest aside, Rust Dust is an inoffensive bonus figure for the set, though not the main attraction. For part four of our look at Combiner Wars Victorion, we’re spotlighting the fourth of the deluxe class limbs, Jumpstream! Jumpstream is a remold of Combiner Wars Breakdown, one of the less frequently used Combiner Wars molds. She’s got a new head and chest, along with new lower arms, and all of this together means she has a different look to Breakdown in robot mode. The vehicle mode is very nice too, with lots of mint green showing. While others in the team might have nicer head sculpts, Jumpstream is a very nice all-round package. Her weapon is a shield, but if you are imaginative you can sling it under her arm and pretend it is a machine gun instead. Part three of our coverage of Combiner Wars Victorion is a double event! We’re showcasing the helicopter twins, Skyburst and Stormclash! The twins reuse the Alpha Bravo helicopter mold, and while they retool it with new arms and a new chest, I found taking these photos brought with it a certain “mold fatigue”, possibly due to three out of the previous four combiners I did a shoot of using a version of this mold. 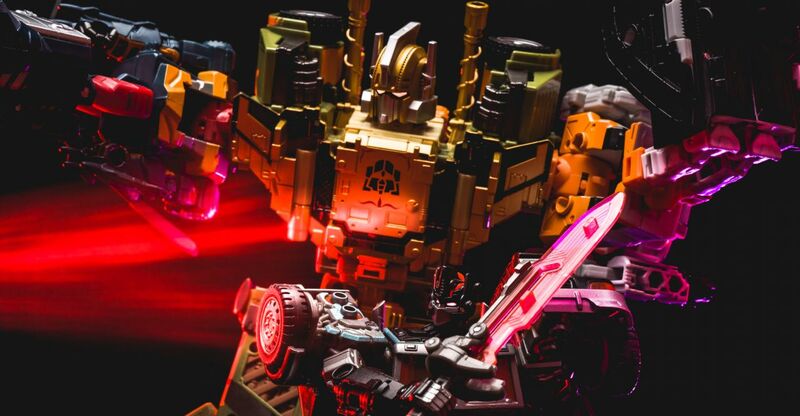 Not knocking what is at its core a fun toy – just one that has been ubiquitous throughout the Combiner Wars line. The new tooling does help – the twins’ heads are supurbly done, and the new arms really freshen things up. I also like how the decos are mirrored – something that the instructions play into as well, with the direction to fold the tailfin in opposite directions depending on which twin you are transforming. Each twin wields a huge curved sword which forms the main part of the Victorion sword blade – a really nice accessory which looks great in the hands of the toys. Part two of our Combiner Wars Victorion photoshoots is now online, and we’re diving right into the Deluxe class members of the group, starting with Dust Up! Dust Up is a remold of the Combiner Wars Dead End mold. Like all the Torchbearers, she’s got new hands, a new head, and a new chest, and this sets her apart from the rest of the uses of the mold. The new molding is very well done, and we can’t shake the feeling that there might be a Nightbird reuse at least considered for this one. Her personal weapon is a crescent moon blade, which looks suitably dangerous for anyone getting in her way. We are kicking off an overdue new update to our galleries, looking at the fan-made Combiner, Victorion! Made up of six female Autobots – Pyra Magna, Dust Up, Jumpstream, Skyburst, Stormclash, and Rust Dust, Victorion sports a unified red and green “rust” inspired colorscheme across all her component figures. The five larger toys also feature new weapons which merge into a huge sword, new heads, new chests, and new hands / arms. With the amount of remolding involved, all the individuals feel like they have their own identity – and we’ll come to them in more detail when we do their individual galleries. Victorion herself has some great design going on. First and foremost, the combined mode features a new head, and a new chest (though you don’t see much of this with Rust Dust attached). The combiner also has new dedicated hand and foot parts, which again set Victorion apart from those that went before. The new feet have ankle tilts and toe articulation, which makes it much easier for Vicky to strike wide stances. The hands also have some finger articulation, which helps with bringing some poses to life. 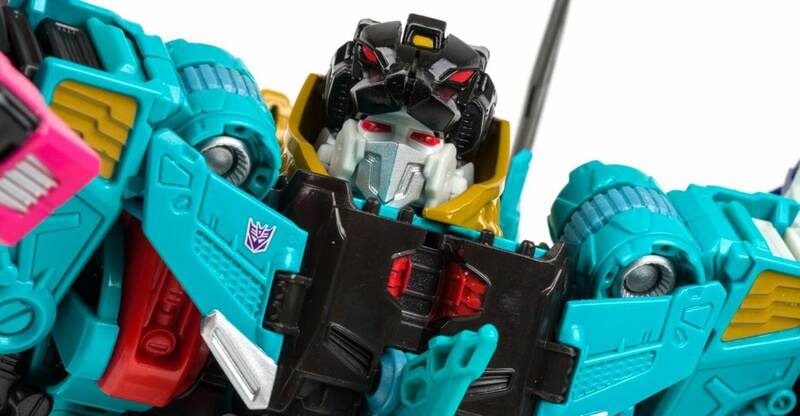 I also complement the new combined mode head molding, which evokes the Generation 1 style of “helmet fitting over a smaller robot head”. That said, Victorion is not flawless. A running problem I had with all six toys was that their paint seemed to chip very easily. Rust Dust also has a lot of problems staying attached, if you plug her in so the Autobot symbol is right-side up. The new hands also have the 5mm socket drilled through an odd place in the hands, behind the thumb, which can look like Vicky isn’t holding her weapons in her hands. Your mileage may also vary on the choice of colors, butI will say that in hand they do go well together and look much better than earlier highly-saturated images led on. May Mayhem is upon us – and as was the way in 2015, Hasbro has a sharp new exclusive Combiner Wars figure for us to enjoy. This year, we’re getting a Combiner Wars release of the deluxe class Groove, to round out the classic style Defensor and Protectobot lineup! Groove started out life as a new mold made by Takara-Tomy for their Unite Warriors version of Defensor. Where Hasbro had made a Legends class version of Groove – so that the motorbike would not be the same size as a police car or a helicopter – Takara went with the homage to the original look with a full on Deluxe class toy. Since I went Hasbro with my Protectobots, this is my first experience with Groove, and it is good. The design is very faithful to the Generation 1 Groove – right down to the boxy body proportions and squared head. Poseability is excellent, though since most of the Combiner Wars ‘bots share a basic design I expect this by now. Shoutout goes to the twin pistols, which are unlike any other Combiner Wars weapon, and look excellent (especially the nice detail of the sirens on the backs of the guns). For our next gallery of the Combiner Wars line, we’re giving some love to the surprise announcement that caught us all off guard last year, Sky Lynx! For years, a new and updated Sky Lynx seemed to be one of those things we would never see, and yet, here he is – and he’s rather nice. 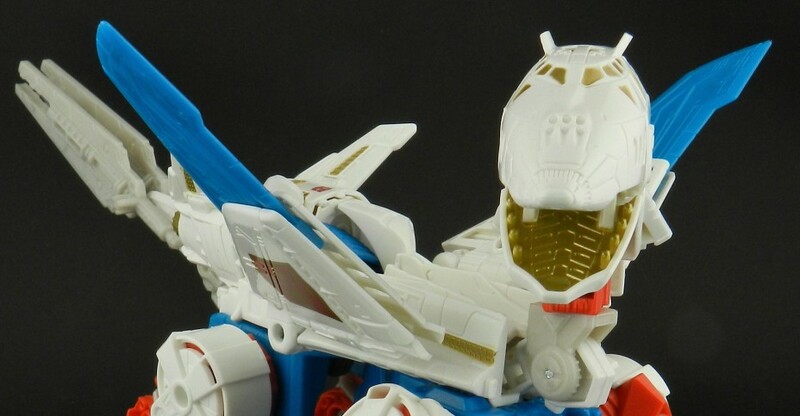 Sky Lynx’s new incarnation is every bit as quirky as the original, going from space shuttle to space dragon modes. Both modes are chock full of molded details, and the dragon mode has decent poseability, although it’s let down by the rear claws not locking out and consequently folding up under the weight of the toy. What was a surprise for me personally, though, was the Sky Reign mode. Sky Reign was something I, and a lot of others, wrote off as just being an inclusion to fit with the line’s theme. Playing about with it for this gallery, though, I really warmed to Sky Reign, and especially to how the shoulders allow for some forward flexing in the arms, which is a really nice touch. Word of warning for those wanting to do this mode, though – the leg ratchets were not overly strong on mine, and I’ve heard others say the same. For those missing the Lynx mode of the original – fear not, there are fan mode options available without any modifications. Rounding out our pics of Combiner Wars Legends Wave 5, we have a look at the sinister cyclopian Decepticon, Shockwave! This Decepticon is one of the best toys to be made in this size class, and a great update of the original Shockwave! Shockwave’s robot mode is the star of the show, here. Unencumbered by extraneous vehicle parts, the robot is plain solid, and a nice little action figure. He’s got a great range of poseability – some of the best in the size class – and the looks are on-point with what you’d expect for Shockwave. 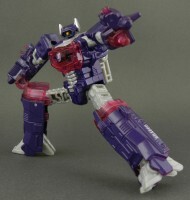 He transforms into a “spaceship”, with a flip down peg for his gun mode. Really, the spaceship mode is a concession to give Shockwave a mode that does not depend on another toy to work, and the gun mode is arguably the real alternate mode. Sadly, the peg for the gun mode is actually obstructed by a square block – most toys hands simply will not fit the 5mm peg because this block gets in the way. Said block is there to steady the gun in the hands of a Combiner, so it’s got a purpose – it’s just a bit of a poor design choice that severely limits what you can do with that gun mode.